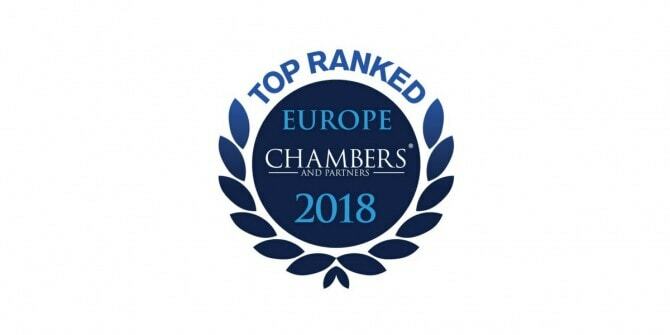 Asters' position as a leading Ukrainian law firm is re-confirmed by Chambers Europe, an influential annual review of the European legal market, in its 2018 guide recently published in London. The publication praises Asters' Managing Partner Oleksiy Didkovskiy as eminent practitioner, the highest possible individual rank, in Corporate/M&A, and Senior Partner Armen Khachaturyan as eminent practitioner in 4 practice areas – Banking & Finance, Capital Markets, Corporate/M&A and Restructuring/Insolvency. Banking & Finance (Band 1). Asters' "market-leading team with a long-standing reputation" is headed by senior partner Armen Khachaturyan, "versatile eminent practitioner" and "a highly established name in the Ukrainian legal market". Partner Iryna Pokanay "regularly leads on the team's key deals" and "has a strong track record in advising developmental banks such as IFC", and counsel Gabriel Aslanian is praised by clients as "quick, responsive" and "a good negotiator". Competition/Antitrust (Band 1). Asters' competition and antitrust practice "remains a top choice for high-profile domestic and cross-border merger filings, regulatory investigations and related disputes". The practice head, partner Igor Svechkar is recognized as "a leading antitrust practitioner able to produce very deep and specific answers in a very short period of time", and partner Alexey Pustovit is described as "an active competition lawyer, advising clients on concerted practices, merger control and cartels investigation". In Energy & Natural Resources Asters team is praised for "knowledge of the market and wide-ranging connections as well as the speed of their assistance", while partner Yaroslav Petrov climbs a tier to Band 2 following strong feedback from clients highlighting his "dedication and focus on his client's aims". In Tax Asters' team is praised for being "particularly experienced in tax structuring issues related to M&A activity" and partner Constantin Solyar "enters the rankings on the back of extensive positive feedback". Asters' Intellectual Property practice moves up to Band 2 thanks to "client-oriented approach of the team", and partner Julia Semeniy is described as a"very knowledgeable IP lawyer". Asters is also recommended in: Corporate and M&A with a "very good and attentive" team; Restructuring/Insolvency as a team with "exceptional track record"; Capital Markets practice as a "solid team providing local law support to international financial institutions"; as well as in Dispute Resolution: Arbitration, Dispute Resolution: Litigation, Employment, Real Estate practice areas.